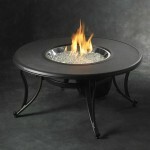 As you could surmise from the title, this is a round fire pit with a thick black rim around the burner bowl. With this one, you can place drinks on the edge while the fire pit is in action, BUT it also comes with a glass insert which covers over the burner bowl and gives you a classy end table. 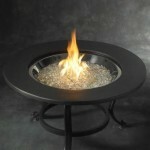 Very close in style to the Saturn Fire Pit, this one comes with a black stone center top which fits over the burner bowl. The aluminum powder-coated frame equips it with outdoor durable which you can enjoy as a centerpiece to your patio or an end table for your couch. 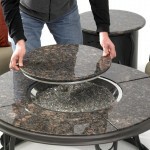 British Granite tabletop with a British Granite insert which ALSO functions as a Lazy Susan. Could things get much better? It also includes gorgeous diamond colored fire gems which fill the burner bowl and accentuate the beauty of the fire light. 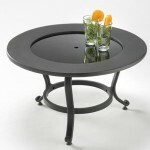 An attractive fire pit and table to have out on your patio.